Why do I sit in a car when its 40+ degrees with no shade to speak of for hours on end?! The sun is burning everything, there’s a haze in the air, its dusty, its dry and not a single cloud to speak of and yet here we are in the South African part of the Kgalagadi Transfrontier Park (formerly known as Kalahari Gemsbok National Park). The reason for that is, there are five lions – young ones – three males and two females lying somewhat relaxed in the shade some thirty meters or so from the water. I say “somewhat relaxed” because there’s a Giraffe who is obviously very thirsty and wants to get to the waterhole. A little further off a group of Gemsbok ( Orix Antelope ) are also waiting impatiently as are the Springbok who seem to be content to let the Giraffe get the first shot at the waterhole. Of course we are all waiting to see if the lions will react if any animal comes within striking distance. Lions being opportunists will take their chances when presented and this looks like one of those times as the Giraffe is ready to risk a possible attack to get to the water. 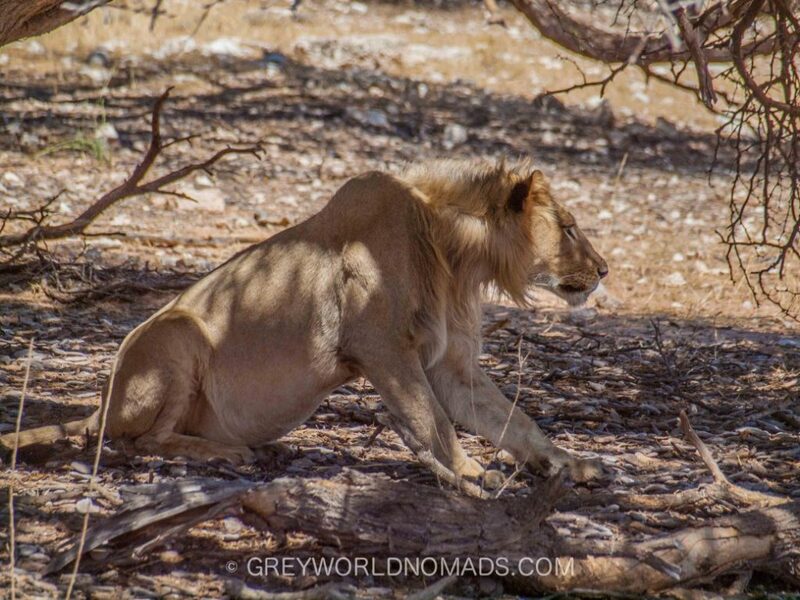 The lions, sprawled under the Camel thorn trees (in the shade) ears up, tails twitching, getting ready to pounce. Luckily for the Giraffe this is a young and inexperienced lot and they rush without much conviction too early and the Giraffe merely canters off a hundreds meters or so. The lions return to their spot under the shade and flop down in apparent exhaustion. And so begins the whole saga again: the giraffe slowly making its way back to the waterhole, the Gemsbok and Springboks waiting to see if it’s safe, willing the Giraffe on. Eventually the lions move to a more shady spot a little further from the waterhole and the Giraffes patience pays off as he can now get that much needed drink. The Gemsbok and Springboks seeing their opportunity also drink their fill before moving further down the dry riverbed a safe distance from the now sleeping lions. The lions also wonder up to the water to slake their thirst every so often and peace is restored. 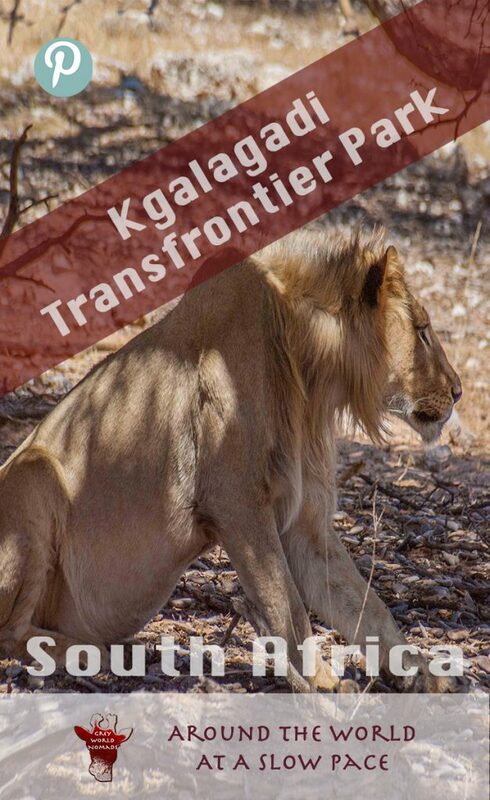 This is the Kgalagadi Transfrontier Park, an area only slightly smaller than Switzerland at approximately 38,000 square km. 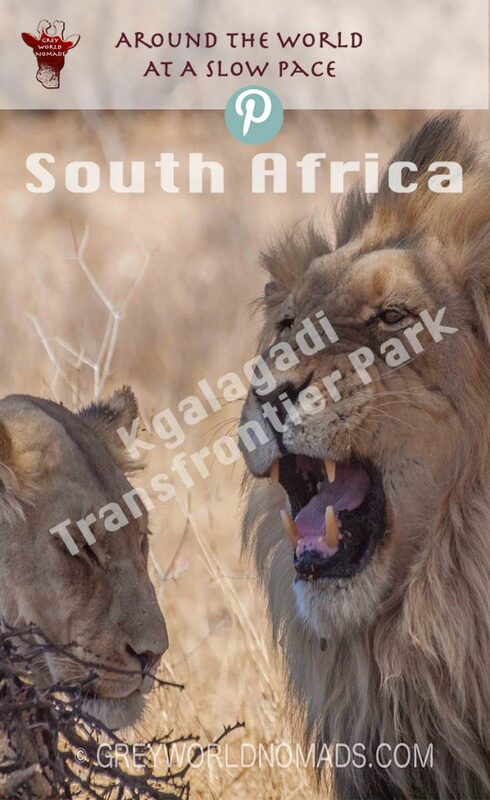 Situated in the Northern part of South Africa and crossing the border into Botswana it was formally declared a Transfrontier Park in May 2000. 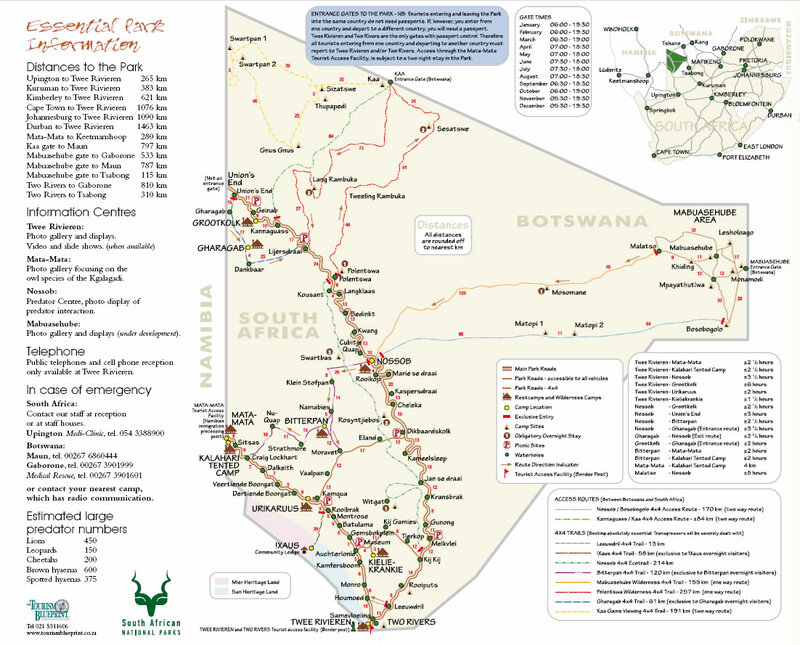 The south-western part of the park comprises dune veld, with its unique semi-desert vegetation while the north-east comprises Kalahari plains thorn veld. Also and playing an important role in the grazing and life patterns of the animals are the salt pans. Its a great place to see Lions, Cheetah, Leopard and a host of other predators and scavengers. The bird life is phenomenal even for this dry dusty, extremely hot and sun baked world. 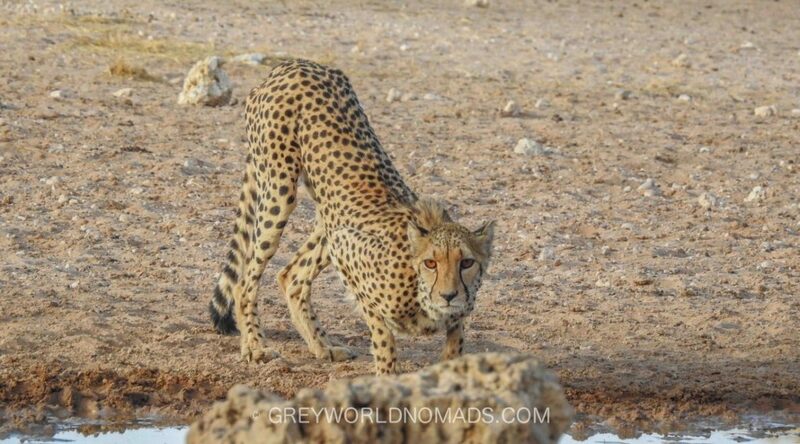 Antelope species such as Gemsbok, Wildebeest, Springbok abound but the real gem here are the smaller animals such as Suricates, Mongoose, Ground Squirrels and its fair share of reptiles. No Buffalo, Elephants, Hippo or crocs as grazing and water is scarce. Accommodation from camping to luxury lodges to self catering wilderness camps (accessible by 4×4 only) is available. The three main camps all have fuel, small shop, information centre and reception. Each camp has a small swimming pool which proved to be a life saver as it is seriously HOT! Activities such as Game drives or walks can be booked at the camp reception. We spent hours sitting at the bird hide at the camp especially at night and in the middle of the day (to escape the heat) watching the animals coming and going from the waterhole. Our two most memorable moments were the lions roaring at night and one of the scariest thunderstorms I have ever experienced, but it is hard to pin it down to those two as every day is different with new sightings and happenings. A great park to visit at any time, summer (extremely hot) or winter and yet another place we shall be returning again and again.